We acquired seventeen letters in the sale, ranging in date from 1594 to 1675, covering a wide range of personal, literary, and political topics. 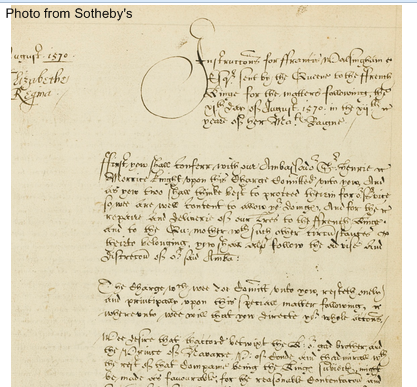 Autograph letter from Lord Burghley to the Earl of Essex, 1597. Another highlight is a letter sent by Elizabeth Stuart, Queen of Bohemia, to her brother Charles I. Dated 1636, Elizabeth was at this time a widow living in exile in The Hague—a queen in name only. The conflict that would become known as the Thirty Years’ War had broken out in 1620, shortly after she and her husband Frederick, the Elector Palatine, assumed control of Bohemia (part of the modern-day Czech republic). Elizabeth fled with her children to The Hague in 1621, where she remained until returning to England in 1661. In this letter, she urges Charles to support her efforts to regain the throne in Prague for her son, Charles Louis. It is signed, “your most humble and / most affectionat sister and / seruant / Elizabeth” and like her other letters, secured with silk floss over her seals. An amusing letter from Sir Robert Howard to Thomas Clifford in 1668 reveals Howard’s tongue-in-cheek defense of his poem “The Duel of the Stags,” which was interpreted by many readers at the time to be an allegorical reflection on King Charles II. Howard here vehemently denies any allegorical intent, insisting that his poem is really, truly about two stags in a meadow, and not about the king at all. Robert Devereux, Earl of Essex. Autograph letter signed to Maurice of Nassau concerning Antonio Perez (Shakespeare’s Antonio), 1594. William Cecil, Lord Burghley. 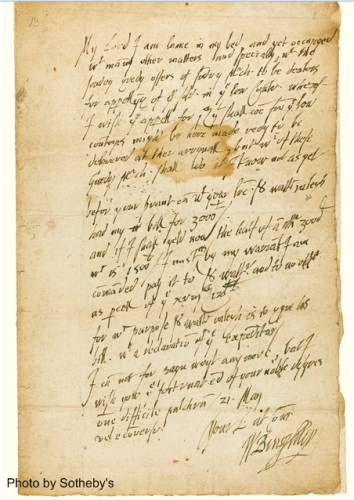 Autograph letter signed to Robert Devereux, Earl of Essex, concerning Sir Walter Raleigh, May 21, 1597. Charles Howard, Earl of Nottingham (Lord Howard Of Effingham). Autograph letter signed to Julius Caesar, Judge of the Admiralty, . Sir William Killigrew. Autograph letter signed to Sir Robert Howard [162?]. Lodowick Stuart, Duke of Richmond and Lennox. Autograph letter signed to Lord Herbert of Cherbury, October 3, 1623. Henry Wriothesley, Earl of Southampton. Autograph letter signed to Lord Spencer (ca 1624). Edward Herbert, Baron of Cherbury. Autograph letter signed to Charles I, May 8, 1626. Elizabeth Stuart, Queen of Bohemia. Autograph letter signed to Charles I, 1636. Marie de Medici. Letter signed “V[ot]re Bien Bon[ne] Cousine Marie” to Henry Rich, the earl of Holland, 1638. Abraham Cowley. Autograph letter signed to an unnamed English lord then resident in Poland, 1650. William Dugdale. Autograph letter signed to Guibon Goddard, June 17, 1657. William Cavendish, Duke of Newcastle. Autograph letter signed to an unnamed Dutchman, August 2, 1657. James II. Letter signed to Horatio, Lord Townshend, Vice Admiral of the County Of Norfolk, . Sir Robert Howard. Autograph letter signed to Thomas Clifford about his poem “The Duel of the Stags”. July 26, 1668. Peter Killigrew. Autograph letter signed to his sister, concerning opening night of Sir George Etherege’s “The Man of Mode,” March 14, 1675. Andrew Marvell. Autograph letter signed to Sir Henry Thompson, June 26, 1675. One of the most exciting purchases we made was a manuscript copy of Ephemeris Chirographorum quorum dam Memorabiliam Succincta in the hand of the scribe Henry Feilde. This stunning calligraphic volume contains a wide variety of manuscript tracts, verses, and commentary, particularly focusing on the downfall of important public figures of the period such as Mary Stuart and Sir Walter Raleigh. Henry Feilde has a distinctive hand and is notable for also having copied out several sermons by John Donne, which are held by the Bodleian Library (MS Eng.th.c.71). At this point little is known about Feilde, but we look forward to discovering more about him. 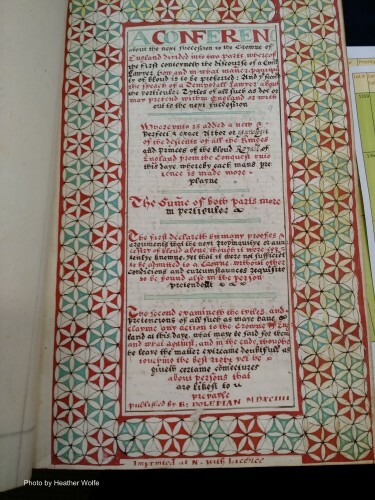 One of the ornate pages of the Henry Feild manuscript. While the Feilde manuscript is magnificent in both content and form, we were also pleased to acquire a hefty book of letters and dispatches from Francis Walsingham, written in a variety of scribal hands. Walsingham was a key figure in Elizabeth I’s government, serving first in her parliament and later as her ambassador to France, where he witnessed the St. Bartholomew’s Day massacre. These manuscripts were written during his tenure as ambassador, and some of the correspondence is addressed to the Earl of Leicester, Lord Burghley, and Queen Elizabeth. These letters and dispatches were later published in 1655 as The Compleat Ambassador, but it is unknown whether or not this manuscript formed the scribal copy for that printing. One of the pages from the Walsingham manuscript. “A Justificacion Of Queene Elizabeth In Relacion To The Affaire Of Mary Queene Of Scottes” by George Puttenham. Copied from a text written ca. 1587, this document defends Elizabeth I for her lack of clemency and ultimate decision to execute Mary Stuart. A scribal copy of “A pithie exhortation to her majestie for establishing her successor to the crowne” by Peter Wentworth. This likely contemporary copy (ca. the 1590s) of Wentworth’s text, written ca. 1576, directly challenged Elizabeth I’s prerogative to name a successor following Mary Stuart’s death. We were fortunate to obtain five lots of poetry and poetic works in the sale. One of the most exciting is an autograph royal presentation manuscript of the sixth book of Virgil’s Aeneid, prepared by Sir John Harington. Virgil’s Latin has been translated on the facing pages into English, including extensive marginal commentary and several essays following the text. We also acquired Thomas Heywood’s translation of Ovid’s Ars Amatoria (The Art of Loving). 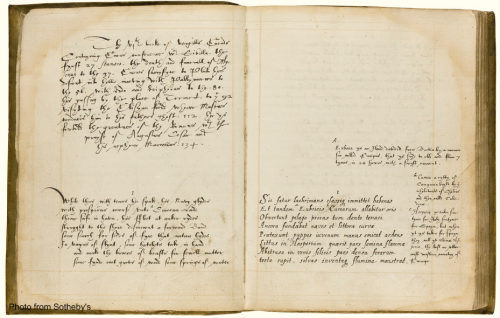 One of four known manuscript copies of the first complete English translation of this work, this manuscript also contains a dedication to the Earl of Southampton. Aeneid manuscript prepared by Sir John Harington, with marginal commentary. These two fantastic manuscripts weren’t the only ones we bought associated with nobility or royalty. Another acquisition is Sir John Stradling’s presentation manuscript of his poem “Beati Pacifici” to James I. The manuscript is signed by Stradling himself below his six-line dedicatory epistle. We also acquired an autograph poem by Sir Kenelm Digby beginning “The thread which doth my painful life sustain…”. This poem was written by the celebrated natural philosopher while mourning the death of his wife, Venetia. Lady Venetia Stanley and Digby had known one another since childhood, and their marriage around 1625 was a love-match that they kept a secret for some time. While Sir Kenelm converted from Catholicism to Anglicanism as a way to ease his passage in the upper echelons of Stuart society, Venetia’s sudden death prompted him to return to his Catholic faith. This heretofore unpublished poem is the only autograph manuscript by Digby that has been available for purchase in the last forty years, and provides a stirring and distressing glimpse into an event that profoundly altered his life. Our poetry purchases also included a manuscript copy of Sir Francis Bacon’s poem beginning “The World’s a Bubble,” a four-stanza version apparently transcribed by Thomas Everard. Finally, we acquired a 1598 copy of Writing Tables with a Kalender for XXIIII yeeres, with Sundry Necessarye Rules. Although lacking its erasable leaves, it includes a lengthy manuscript genealogy of the Cholmeley family, as well as other annotations, and is one of only three copies known to exist. 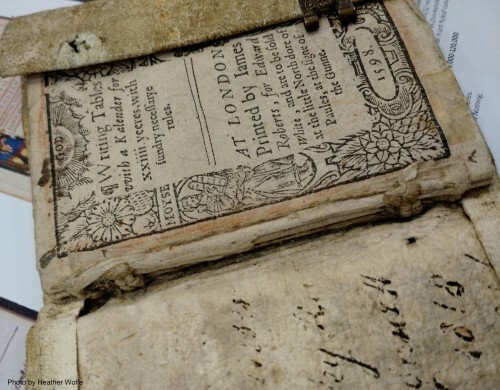 We’re so pleased that these items will be coming to a new home here at the Folger, and look forward to sharing them with all of you, through both exhibition and research.